MoonProject – The Inevitability of Denial in the Corruption of Sport. You are here: Home » Featured » The Inevitability of Denial in the Corruption of Sport. The Inevitability of Denial in the Corruption of Sport. The merging of power and financial reward in sport brings a heady mix of hedonistic fame and fortune and with it the temptation to cheat and corrupt your way to the top. This is nothing new but with the increasing monetary gain that all sports people can achieve the temptation is that much greater. 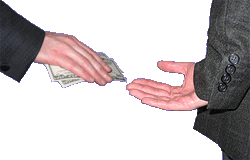 It appears that it is not always the athlete that is looking for financial gain but also administrators, gamblers and those who govern sport that are as corrupt as those who play the sport. However, the severity of punishments administered after such events remains in great debate throughout the sporting world. In 1919 the ‘Black Sox Scandal’ shook the Baseball world when eight players of the Chicago White Sox were accused of intentionally losing games in return for monies gained from gamblers. All were acquitted by the Grand Jury yet Baseball’s National Commission banned all eight players for life from Major League Baseball. The power of one man Kenesaw Landis who had been given unlimited powers in Baseball meant that probably one of the greatest players, ‘Shoeless’ Joe Jackson, never played Major League again even though it became clear he was innocent. Landis’ personal view was allowed to prevail. In this statement all law was thrown out of the window and the power of one man and his feelings became law. The suspensions imposed upon the eight until 2013 were the biggest imposed in Baseball. The personalities involved in allegations are the catalyst for corruption to be brought to the public attention as the bigger a personality, the bigger the scandal and the subsequent fall. The fall of Ben Johnson in 1988 was probably the biggest scandal although the rumours of drug cheating had surfaced well before the Seoul Olympics of that year. There had been consternation at the amount of muscle and bulk Johnson’s body had developed in a relatively short space of time and the remarkable difference in his personal best times in the year preceding the games. His subsequent victory in an astonishing time of 9.79 secs powered by Stanozolol, (a steroid) and his gold medal stripped three days later confirmed the rumours. This begs the question as to why he had been allowed to run? Well, covering your tracks with regard to drugs has become big business and was in 1988. It is clear that the number of athletes who use performance enhancing drugs has increased and continues to increase. Marion Jones, Tyson Gay, Justin Gatlin are just a number of sprinters, you can include the East German swimmers, Kornelia Ender, Petra Priemer, not to mention Lance Armstrong whose years of denial were finally ended. What drives the sportsman or women to resort to gaining an advantage through any means possible and then to deny their misdemeanour or motive? The most recent scandal to hit the sporting world highlights the many reasons that people become embroiled in corruption. Whilst FIFA is the embodiment of the football world, in recent years the accusations of corruption and scandal have damaged both their image and reputation leading to questions being asked about the legitimacy of the venues for the next two World Cups and the integrity of the FIFA Executive committees dealings. Only UEFA, it would seem have questioned the validity of holding a World Cup in Qatar, a country with no footballing pedigree and little or no history attached to the game, a climate that could be severely detrimental to the health of the players and an infrastructure that needs to be built virtually from scratch, yet, it secured the most important world footballing tournament in front of at least three far better equipped nations. It is only now, with the accused beginning to talk ,that the extent of the bribery and corruption involved in the voting of this tournament is being realised. Why is that the other associations throughout the world did not question the voting? Quite simply many of them were culpable in the corruption process and it is not surprising that of the 14 arrested virtually all came from North & South American, Asian and African association and the over-riding motivation for this was financial gain, some for advertising contracts but in the case of Jack Warner, the former FIFA Vice-President in order to pay off his own personal credit cards and businesses. Just like Ben Johnson, Lance Armstrong and Kornelia Ender the denial of any wrong doing on the part of Jack Warner has been systematic over a long period of time and authorities did little to investigate the claims against all these athletes and officials when they were initially raised. There is an argument to suggest that it was not in the interest of any of the governing bodies to investigate the claims as they had much to lose. If investigations were held they were in-house, especially in the case of FIFA, which clearly calls into the question of the validity of any such investigation and the role of Sepp Blatter in these investigations. Sepp Blatter became FIFA President in 1998 after defeating the incumbent Lennart Johannson. In 2012 Johannson sought an inquiry into the election of 1998 claiming that Blatter had won through a vote-buying campaign. Blatter acknowledged that vote-buying had occurred but denied any involvement in the process and yet he was allowed to stand for re-election for a fifth-term in 2015! The simple acknowledgement that vote-buying had occurred in most organisations would preclude the man at the top from standing again! Blatter continually denied that there was any corruption within the FIFA organisation even when questions were raised about the World Cup bidding process and the money that was disappearing from FIFA accounts. Now the footballing public are expected to believe that Mr Blatter had no involvement or knowledge of the corruption and bribery within the organisation and the denial will no doubt continue until such time as he is held to account for the affair. At that point the denial will become a bargaining tool in order to secure lesser reprimand. Denial of guilt will always be a tool for those who know that wrong doing has occurred and the denial of guilt in sport will always be from those whose legacy will be severely affected.